Every day managers receive 20 scout points. 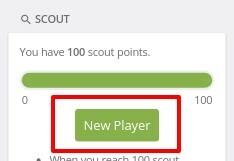 When they reach 100 scout points, the pull-button became active and they can get a new young player for the team. If they don't bet, new player could be pulled on every 5 days. Managers can reach 100 scout points faster (or slower), if they bet on matches.